Tai Chi Society's website is the only one in the world that provides you with ground-breaking articles of the highest quality regarding Tai Chi, written by a true Tai Chi Great Grand Master. Courses for beginners to advanced levels in many suburbs. Tai Chi is an ancient healing practice involving a series of continuous, slow, circular and flowing movements. Sydney Tai Chi : summary for classes, events, etc. Tai Chi Society specializes in the healing properties of Tai Chi. Tai Chi Arthritis, its particular benefits for sufferers. Tai Chi stroke rehabilitation for survivors. Great Grand Master Kellen Chia has written a number of groundbreaking articles of the highest quality regarding Tai Chi and Nei Jin (Internal Power). Tai Chi testimonials on arthritis, insomnia, and other medical conditions. Tai Chi Sydney Course: Tai Chi and Qigong courses in Sydney are for beginners to advanced levels, and are suitable for all ages and fitness levels. Tai Chi and Qigong are taught together in the classes throughout the eight-week course in all our Tai Chi Sydney branches. Qigong will help students to become more relaxed and improve the ‘chi’ or energy flow while learning Tai Chi. Tai Chi Refinement Classes: You can join our Tai Chi group refinement classes held every three months around Sydney if you have been learning Tai Chi for at least four weeks with Tai Chi Society. This Tai Chi session is a supplement to what you have learnt in the classes in which perhaps you didn’t grasp fully the Tai Chi movements or might have missed one or two little things. Tai Chi Sydney Workshop: This Tai Chi workshop in Sydney is for students who are passionate about the art of Tai Chi. In the workshop Great Grand Master Kellen Chia will teach you in details the Tai Chi movements and demonstrate their intricacy. Also, your Tai Chi forms will be corrected with explanations given on why the forms need to be corrected. The Tai Chi workshop will significantly improve your Tai Chi skill and enrich your knowledge. Tai Chi Instructor Course: A certified programme is offered in Tai Chi instructor training. It is a prerequisite to have done Tai Chi workshops with Tai Chi Society to enrol in the Tai Chi instructor programme. This Tai Chi workshop also will deepen your Tai Chi knowledge and significantly improve your practice of Tai Chi with greater awareness physically, mentally and spiritually. Qigong Instructor Course: Tai Chi Society offers a certified course for novices and advanced practitioners who want to become a Qigong instructor. Only one Qigong instructor workshop is needed if it is followed by additional hours of self-practise with the help from the Qigong instructional DVDs provided by Tai Chi Society. Qigong practice is excellent for physiotherapists, acupuncturists and other medical professionals, reiki and yoga practitioners, fitness instructors, teachers and anyone who is interested in the art of Qigong. For more information please call or email Tai Chi Society. Many believe that practicing Tai Chi three times a day or more, rather than just once a day, will give them mastery in a shorter space of time. This is false. Tai Chi Principles: The article about principles of Tai Chi is a must-read for beginners and Tai Chi Grand Master alike! The true essence of Tai Chi written about in this article will complete your Tai Chi knowledge and wisdom, and enrich your Tai Chi practice. Tai Chi Postures: Having the correct postures of Tai Chi is extremely important for Tai Chi practitioners. Even a Tai Chi master can occasionally forget one or two of these rules, if for example they were taught a long time ago and the detail has unwittingly faded. Without the correct Tai Chi postures one cannot ascend to the higher levels of Tai Chi. Differences between Tai Chi and Qigong: This article, like no other, details everything that differentiates Tai Chi from Qigong. Practitioners of both will deepen their understanding of these two art-forms and appreciate, through contrast, their many subtleties. The Tai Chi Society's other Tai Chi and Qigong articles: There are many more articles published by Tai Chi Society, each offering excellent insight into the various aspects of Tai Chi practice and theory. 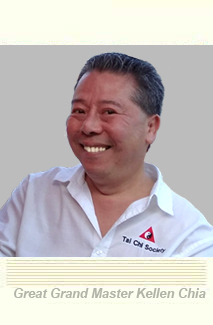 Radio 2UE, 954AM, featured Great Grand Master Kellen Chia on Thursday 13 October 2016 at 3.30pm, hosted by Ed Phillips. ABC Radio, AM702, will feature Great Grand Master Kellen Chia, Saturday 5 March 2016 at 6.10am, talking about his classes and the many benefits of practising Tai Chi. Channel 9 Television Network Australia begins shooting, on 21/12/2006, for the show ‘What’s Good For You’, which will be on air in 2007, casting Tai Chi Society with Great Grand Master Kellen Chia and students. ABC Television Australia: Great Grand Master Kellen Chia begins shooting a film, on 03/12/2007, produced by a film company for the ABC2’s channel identification ads, which feature frequently. A health vitamins company: Great Grand Master Kellen Chia and students start shooting a film, on 10/12/2014, produced by an advertising film company for commercial health vitamins, to be aired on television. Tai Chi Society released two brand new Qigong dvds on 2 June 2014: The Immortal Ten Qigong, and Nine Heavens Qigong. Tai Chi at First Fleet Park, Circular Quay, Sydney, on Saturday 16th November 2013 at 10.30am. We are at the front of the Museum of Contemporary Art. This Tai Chi lesson, for novices and beginners, is open to the public. Join us and breath the fresh morning air of Sydney harbour, moving slowly, gracefully while stretching our tendons, ligaments and muscles. Tai Chi and Qigong at lunch time on Broadway, Sydney: Tai Chi Society, in collaboration with Work-Shop, is giving free introductory Tai Chi and Qigong lessons for half an hour at lunch time. The first class is Thursday 27th June 2013, 1.00pm, at 86 Broadway, Chippendale. This is across the road from University of Technology Sydney. Note: the next introductory Tai Chi and Qigong is on Thursday 11 July 2013. Tai Chi at Market City in Sydney: Tai Chi demonstrations and free lessons for the public by Tai Chi Society at Market City, Sydney on Monday and Friday, May 27th and 31st and Sunday, June 2nd 2013, all at 12.30pm to 1.15pm. It is on the 1st floor, above Paddy’s Market. These Tai Chi events are free for the public because they have been paid for by the Market City management. Tai Chi weekly classes, Sydney city for beginners on Monday night and Saturday morning.